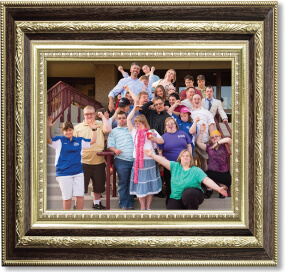 Higher Visions for Education (HVE) is continuing education for adults with Down syndrome designed to enrich their independent living and social skills. HVE explores a variety of topics to learn and practice important life skills and concepts in a fun and meaningful way. Our expected outcomes include increased independence and self-esteem, as well as improved social and community involvement. Themes discussed include: safety, good health (physical, emotional and mental) and hygiene practices, decision-making skills, assertiveness, self-advocacy, independence, age-appropriate behavior, time management, identification of needs and desires, community access, and the development of resources and support systems. Individuals with Down syndrome and other disabilities need to continue learning and practicing social skills throughout their lives and HVE has a demonstrated success on several levels. The program has grown over the years while developing a method and curriculum that works for adults with Down syndrome. HVE works because we use a variety of interactive techniques; we meet the students “where they are” and address real-life situations and needs. A unique aspect of the HVE program is our collaborative approach and regular weekly communication with parents and caregivers to continue the classroom learning in the students’ real life settings. Through parent input we learn the issues and concerns that are most important to address in our classes. We have seen tremendous progress in students’ abilities to communicate their needs and develop life skills. The feedback we get from our satisfaction surveys and communications with parents support our belief that Higher Visions is making a positive difference in the lives of our students and their families.